From vegetables to bicycle parts to cheese to vintage clothing, there is something for everyone at Amsterdam’s weekly street markets. Find the one in your neighborhood. 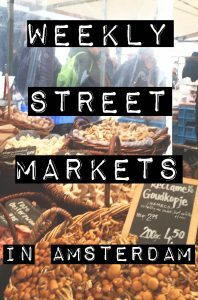 Here are some of our favorite street markets in Amsterdam! 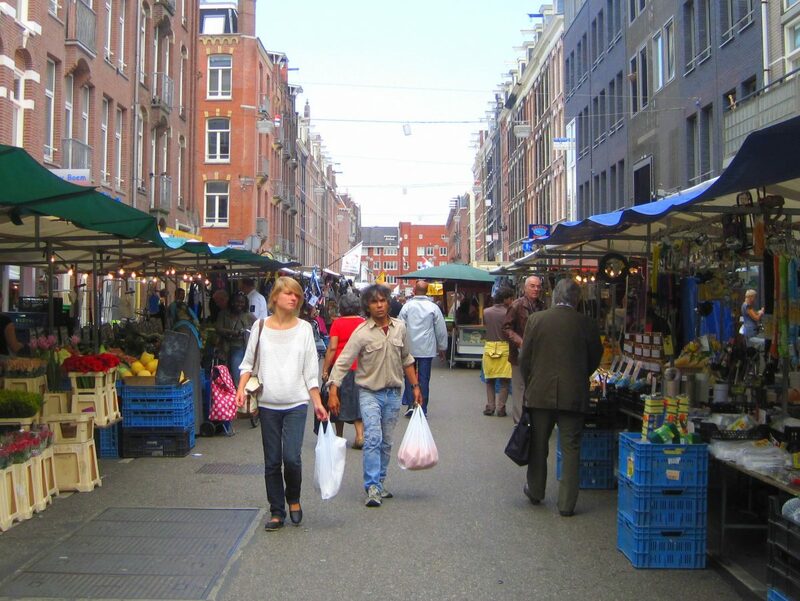 This famous market in De Pijp is open every day except Sunday and has anything the street shopper could wish for. Goofy tee shirts, bicycle accessories, sunglasses, cheeses, fish, shoes, vegetables, flowers, fresh stroopwafels, ribbons, rotisserie chicken…Albert Cuyp has everything you need! The street market has lots of tasty eats, but check out our list of favorite local spots to grab a bite or drink as well! Every Saturday the crowds gather at the beautiful Noorderkerk to shop at the organic farmers market and street market. Of course there is an abundance of fresh vegetables and fruits to choose from, along with baked goods, eggs, cheeses, meats, fish and prepared foods. Our favorite stands include the mushrooms and the homemade sausages, although the bakeries also tempt us. The organic market is at the front of the church along Prinsengracht while a more varied market fills Lindengracht, the street around the corner. After filling your bags with healthy veggies, brave the crowds at Winkel for a taste of their famous appeltaart! If you live closer to the South or the East side of Amsterdam, the ZuiderMRKT is a much more convenient option for Saturday organic shopping. 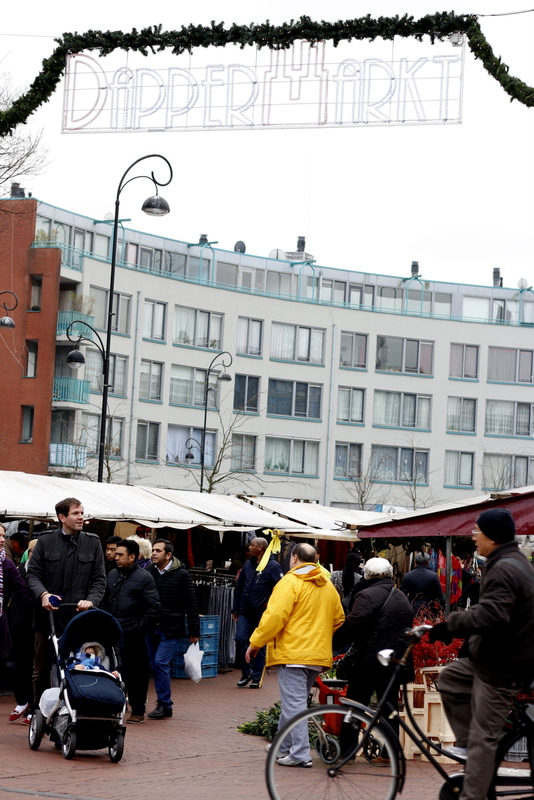 This market is located in Oud-Zuid at the square by Johannes Verhulststraat and Jacob Obrechtstraat. You’ll find a variety of biological fruits and veggies as well as prepared foods, baked goods, meats, eggs and cheeses. Another Saturday organic market is located at Nieuwmarkt near de Waag. 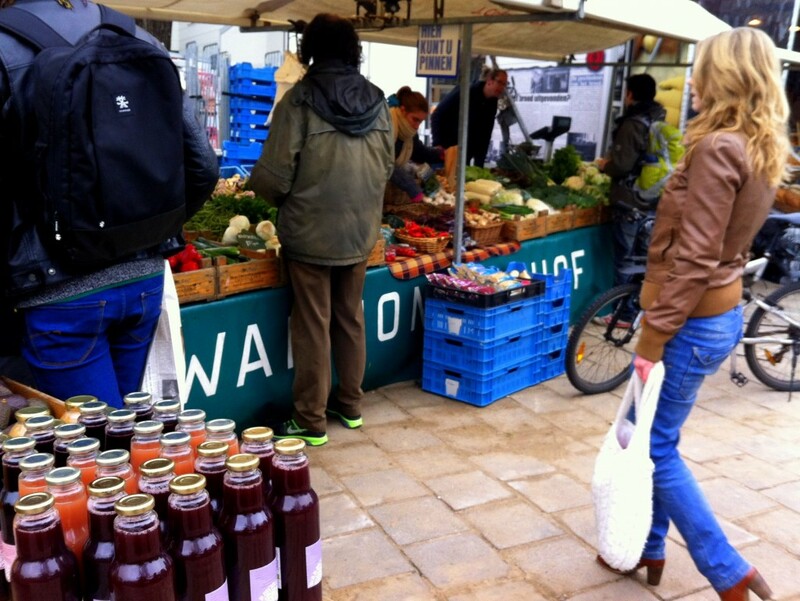 There is also a Wednesday organic market at Haarlemmerplein in the Haarlemmerbuurt. 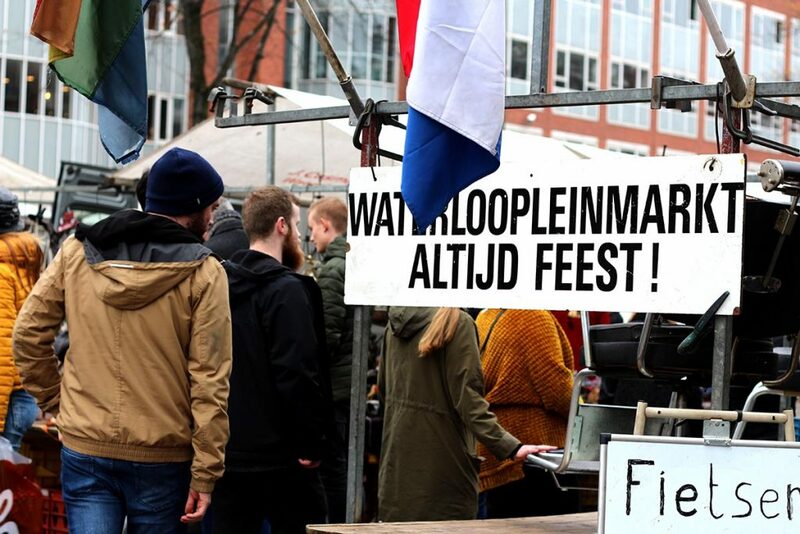 Monday through Saturday the Waterlooplein market is the place to go for all kinds of stuff. 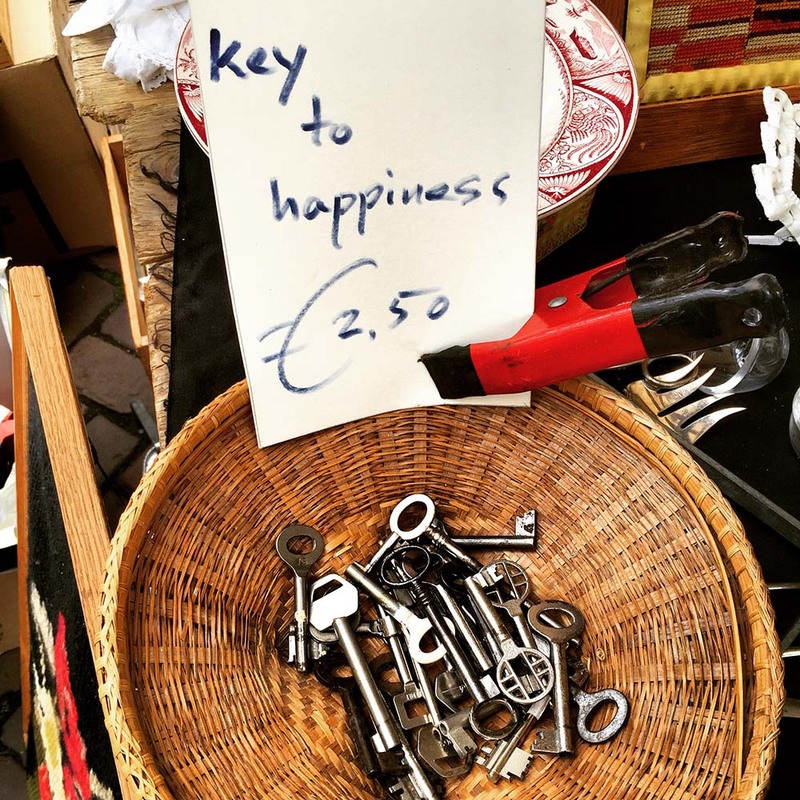 From vintage clothing to bicycle parts, this shopping square is like a daily flea market. Shoes, toys, electronics, jewelry, books…you name it, Waterlooplein probably has it. Some people say that the international name “flea market” comes from the markets that have long stood in this area. The area was originally called “Vlooienburg” and the Dutch word for fleas is “vlooien” while the Dutch name for flea market is “vlooienmarkt”. Others say the name flea market came from the “marché aux puces” of Paris. But hey, we’re in Amsterdam so let’s go with this local story! The area around the market also has quite a few vintage clothing stores. In Oud-West right off Kinkerstraat is the Ten Katestraat, with a small street market that is open Monday to Saturday. Mostly fresh vegetables, fruits, meats and cheese, the market also has bicycle accessories, household goods and some clothing. The stand selling nuts is a favorite of ours! (Tip: visit the VolksKruidenTuin around the corner on Kinkerstraat for a great selection of spices.) Check out our guide to Oud West for more tips in the area. Located on the east side of Amsterdam near Oosterpark is the Dappermarkt, a daily market offering fruits and vegetables along with various personal and household items. You’ll find pretty much anything you need at this great street market open every day except Sunday. 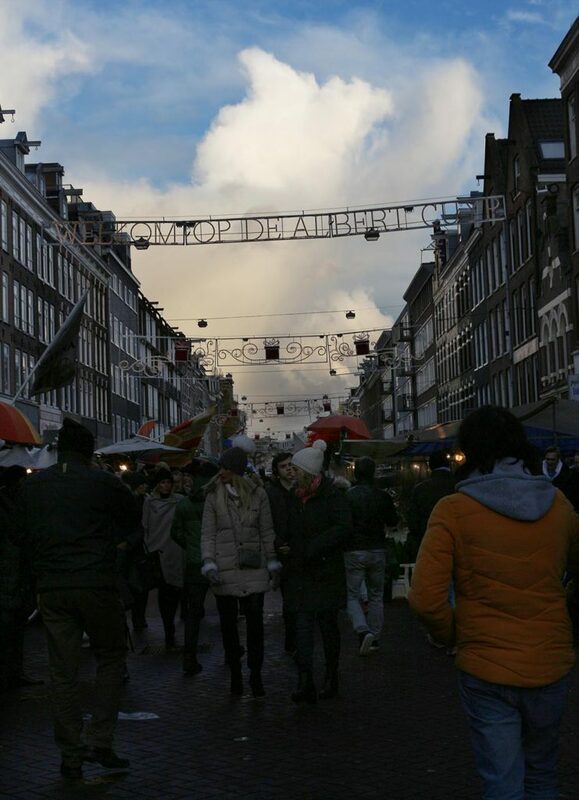 Monday through Friday there is a small market with a few stands at Nieuwmarkt next to de Waag. You can pick up some vegetables or maybe a snack. 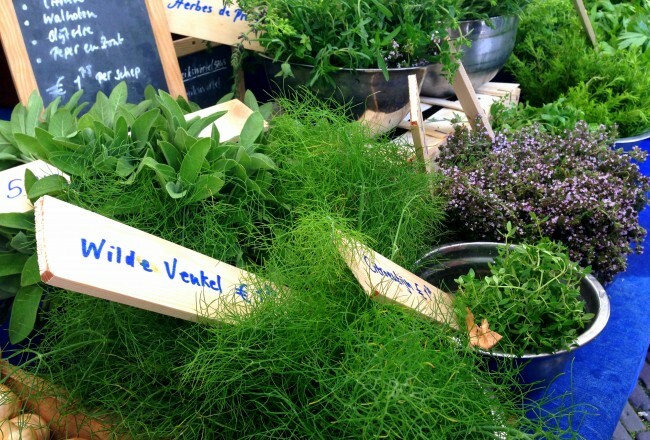 On Saturday there is a larger organic market with produce as well as biological staples and handmade items. Monday morning the Westerstraat and Noordermarkt are taken over by the Lapjesmarkt, a clothing and textile market. A favorite of vintage clothing lovers, here you can find shoes, purses, dresses, jeans, and even fur coats as well as fabrics and trimmings of all kinds. There are also several stands with antiques and retro finds. 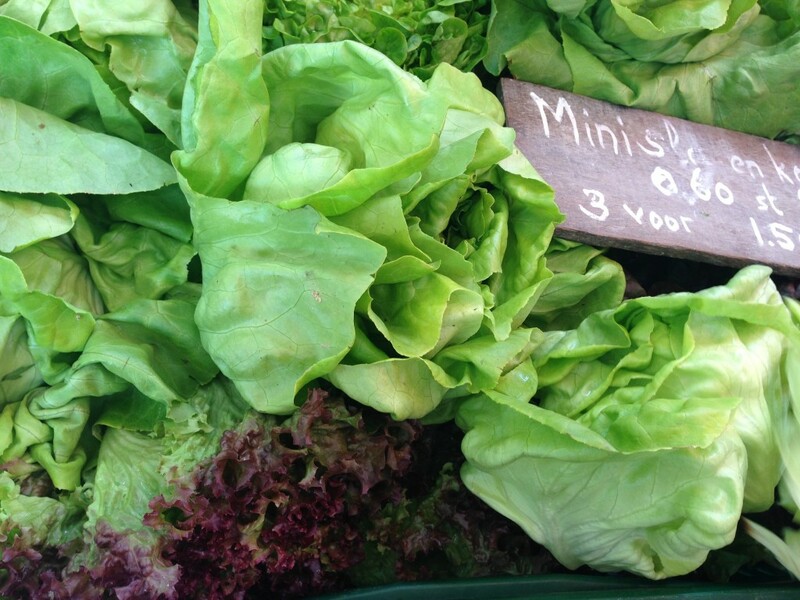 Make your way to Noord for the Pekmarkt on Wednesdays, Fridays and Saturdays. This newer market takes place on the refurbished Van der Pekstraat. You’ll find fruits and veggies as well as all types of goods for your home, local honey, prepared foods and a whole lot more! Head around the corner to the Mosplein where the Mosveldmarkt previously stood. This is now part of the Pekmarkt. The goods at the market change depending on the day of the week, if you are looking for organic produce be sure to visit on Friday. 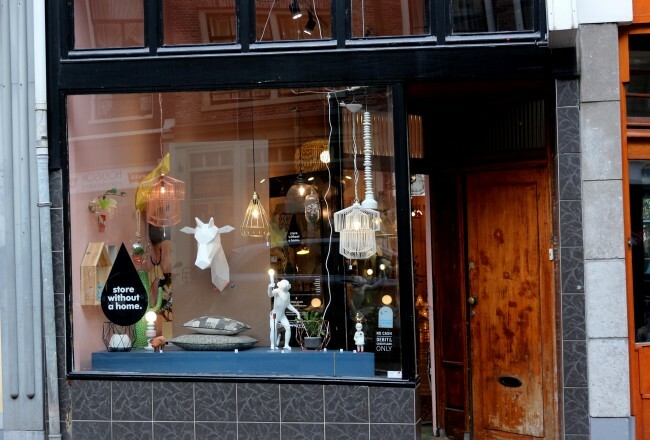 Spend the whole day in Noord and visit some more of our favorite neighborhood spots! 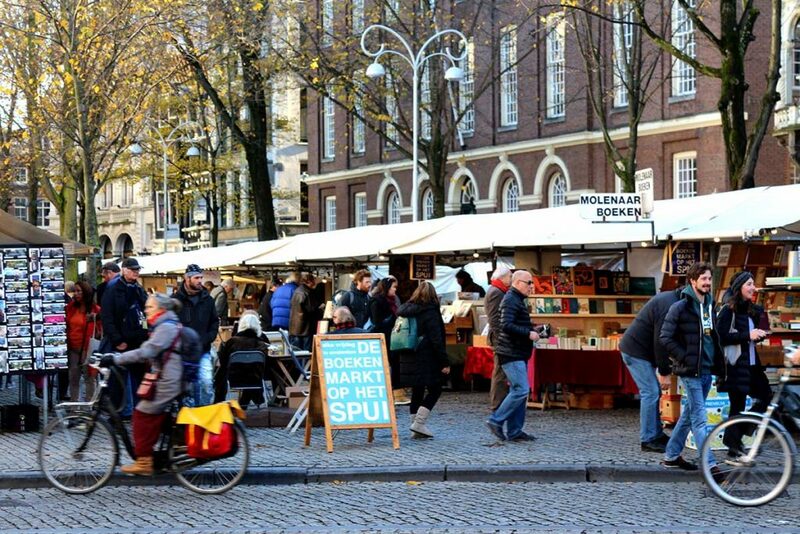 Every Friday at the Spui there is an open-air used book market. From comics to trashy novels, all kinds of reading materials can be found here at the Boekenmarkt. Most of the books are in Dutch but you can find a lot of books in English and some other languages as well. Of course we cannot forget to mention the famous Bloemenmarkt floating flower market located on the Singel canal next to Rembrandtplein. It’s mostly a tourist market but you might be able to find a local or two stopping by. Lots of fresh flowers, bulbs and all kinds of knick-knacks can be found here. Sometimes locals can forget that this market is interesting because the shops actually float on the water of the canal behind them. Which is pretty cool if you think about it! You might notice there is a boat just across the canal that is used as a bike parking lot. The Bloemenmarkt is open every day except Sunday. It’s not a weekly market but the IJHallen flea market is worth a mention. This frugal paradise takes place once or twice a month across the IJ in Amsterdam Noord. The huge market is held inside the giant old NDSM shipbuilding structures, and outside as well when the weather is decent. Entry is €4 per person. You can find almost anything: used clothing, shoes, toys, tools, kitchen supplies, and tons and tons of random junk. Prices are (mostly) very low. For more info, check out our IJHallen article. 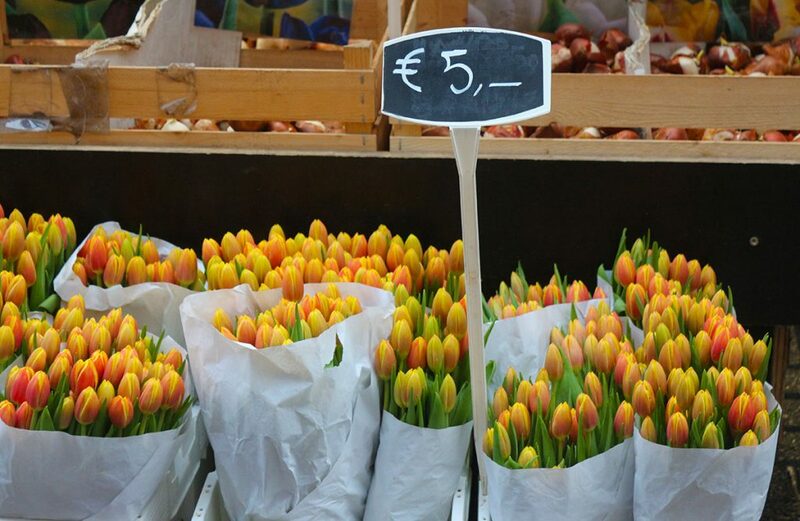 For more markets around Amsterdam and all over the Netherlands, check out hollandsemarkten.nl. 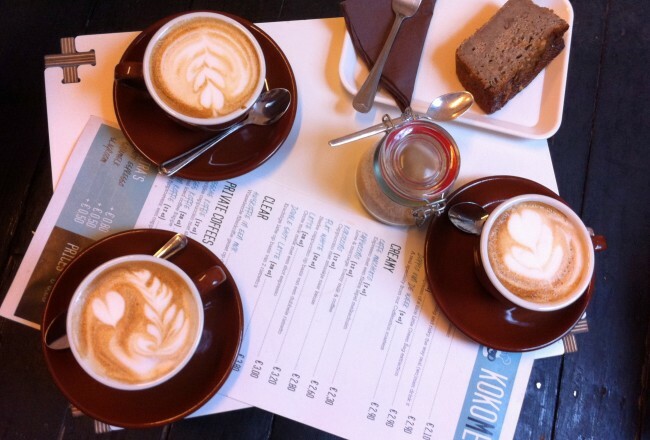 And take a moment to check our Amsterdam agenda and see what special markets might be on now.